The Bloch MB.170 and its family of derivatives were French reconnaissance bombers designed and built shortly before World War II. They were, by far, the best aircraft of this type available to the Arm�e de l'Air at the outbreak of the war, with speed and maneuverability that allowed them to evade interception by the German fighters of the time. Although the aircraft could have been in service by 1937, debate over what role to give the aircraft delayed deliveries until 1940. Too few in number to make any measurable impact on the Battle of France, they continued in service with the Vichy forces after the armistice. The MB.174 will also be remembered as the aircraft flown by Antoine de Saint-Exup�ry, author of The Little Prince during the campaign. His work Pilote de Guerre - translated as Flight to Arras and published in 1942 - is based on a 1940 reconnaissance mission in this type of aircraft. In 1936, the Ministry for the Air initiated a programme of modernisation of French aviation which included a request concerning a general-purpose passenger aircraft that could also be used for missions of light bombardment and reconnaissance. The Bloch workshops proposed the MB.170 then, after many modifications, the definitive MB.174 version. After the 50th example was delivered in May 1940, the MB.175 succeeded the MB.174 on the assembly lines in full flow. This version, a dedicated bomber, had a redesigned bomb bay capable of carrying bombs of 100-200 kg (220-440 lb), where the MB.174 was limited to 50 kg (110 lb) bombs. The MB.175's fuselage was lengthened and widened to accommodate this greater capacity, but only 25 specimens were delivered before France's defeat. They were eventually used in the same reconnaissance units as the MB.174s. The MB.176 was a version with Pratt & Whitney R-1830 radial engines but which proved to have poorer performance than the MB.175. It was ordered into production in order to ease demand on the French engine manufacturers. The Bloch MB.174 flew for the first time in July 1939 and entered in active service in March 1940. It was issued to strategic reconnaissance units where it replaced the Potez 637 that had proved too vulnerable during the Phoney war. Its first operational mission was flown by the famed pilot and writer, Cap. Antoine de Saint-Exupery, of Groupe de Reconnaissance II/33, on 29 March 1940. The Bloch 174 appeared extremely effective in these missions as its speed and maneuverability at altitude allowed it to escape from most modern Luftwaffe fighters. Only 3 examples were lost to enemy fire during the Battle of France. However, like the majority of the modern equipment of the Arm�e de l'Air during the campaign, they arrived too late and in insufficient numbers. At the time of the armistice, most surviving MB.174s and 175s had been evacuated to North Africa. A few were recovered by the Germans and then used for pilot training. During the Vichy government rule on the French empire, MB.174s frequently flew over Gibraltar to monitor the British fleet. In March 1941, German engineers used engines taken from MB.175s (as well as other captured aircraft) to propel the Messerschmitt Me 323 cargo aircraft, some of which actually flew with parts taken from already complete MB.175s. After Operation Torch, as French forces split from Vichy to side with the Allies, remaining examples of the MB.170 line flew their final combat missions during the battle of Tunisia. They were replaced by reconnaissance variants of the P-38 Lightning, and used as transports and target tugs. 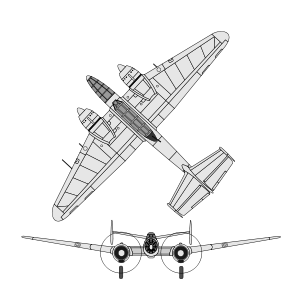 A final version designed for the torpedo bomber role, the MB.175T, was built in small series in 1947 and served with the A�ronavale until 1950. MB.170.01 - The first prototype, equipped as reconnaissance aircraft, powered by Gnome-Rhx´ne 14N-06 engines. MB.170.02 - The second prototype, equipped as light bomber, powered by Gnome-Rhx´ne 14N-06 engines. MB.174.01 - The original MB.174 prototype, powered by Gnome-Rhx´ne 14N-49 engines. MB.175.01 - The original MB.175 prototype, powered by Gnome-Rhx´ne 14N-48 engines. MB.175B.3 - Second production version. 23 built, plus 56 unarmed aircraft for the Luftwaffe, powered by Gnome-Rhx´ne 14N-48 engines. Post-war torpedo bomber version for the Aeronavale. 80 built. MB.176.01 - The original MB.176 prototype, powered by two Pratt &amp; Whitney R-1830 SC 3-G Twin Wasp engines. Single prototype, powered by two Hispano-Suiza 12Y-31 inline engines. Further development , construction halted by arrivasl of German forces.